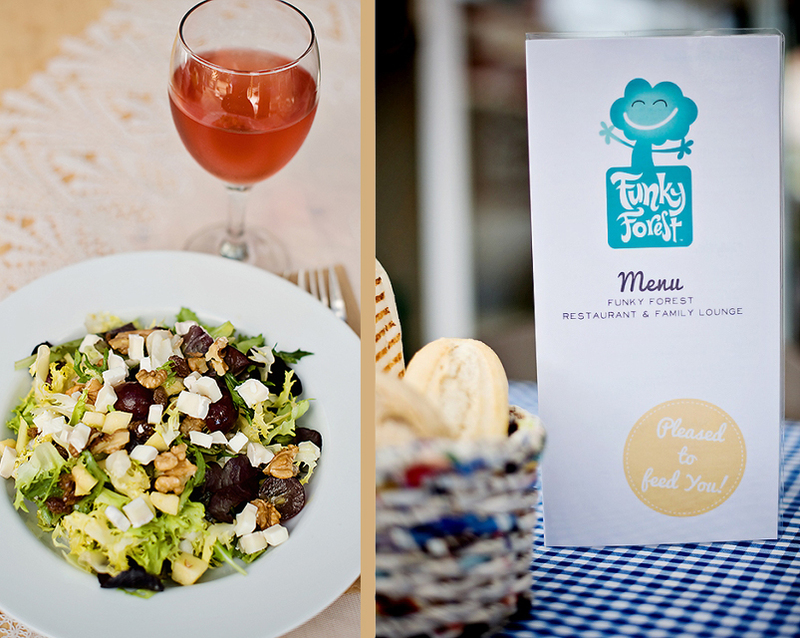 Funky Forest Cafe is the ideal place for families with kids and a perfect party location. A place to play, create, stimulate and enjoy some quality time together. Whether you come with your children or with friends, this special destination offers something for everyone. Located in the heart of the Costa del Sol and set in a rural environment, we offer the possibility to enjoy a quality coffee, fresh smoothies, homemade cakes and selection of dishes from our restaurant menu. The majority of our ingredients are locally produced and in our kids selection we offer a variety of gluten- and dairy-free options. 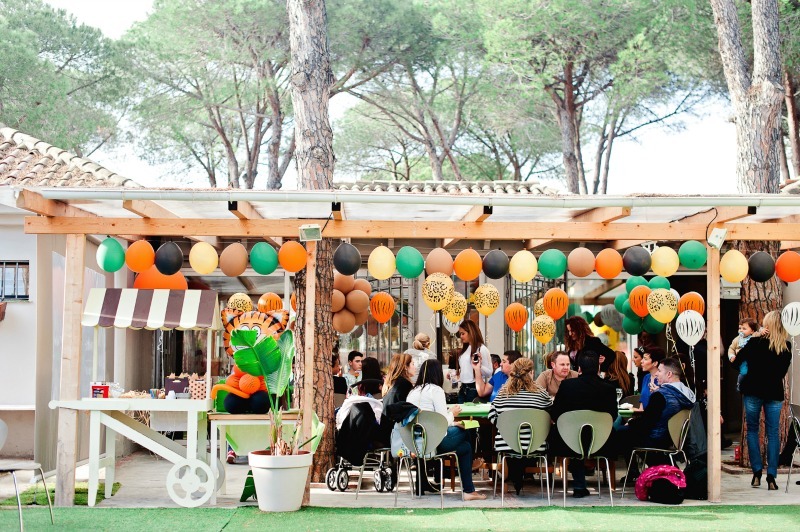 With a sunny terrace, free wi-fi connection, indoor-and-outdoor play areas, and a private area for pet rabbits and guinea pigs, this cafe has created a family-friendly venue, organising workshops, activities and hosting private events such as birthday parties, christening parties, first communion parties and baby showers. 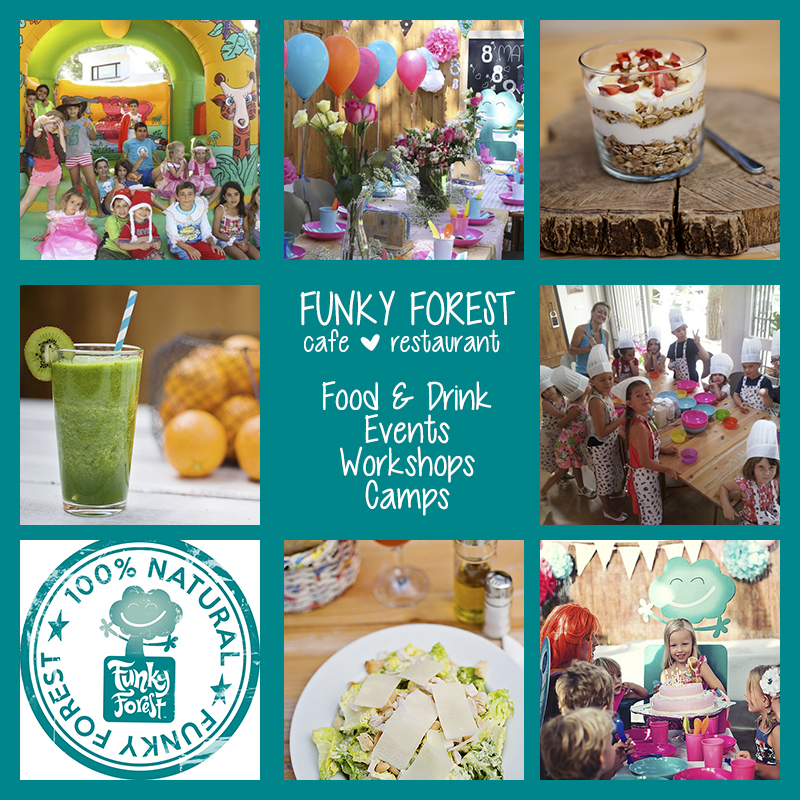 Funky Forest organizes events year round, celebrates local and international holidays and host holiday camps during all holidays for children from 4-to-10 years of age. Check the website www.funkyforest.es and facebook page (Funky Forest Cafe) to stay up to date with all of our upcoming activities and events, join our newsletter or send an email to info@funkyforest.es and we will be happy to answer all your questions. See you soon at Funky Forest! From Marbella to Estepona: follow the CN340, make u-turn at Cancelada exit, continue towards Marbella, take the exit to the right after the Hotel AGH, continue parallel to the CN340 for 200 m and you will find us on your right hand side. Funky Forest Cafe is unique and caters for families with a mini zoo and loads of toys for the children to play with and on! WE enjoyed it but we didnt have the kids so i guess its more about peace of mind in a child orientated restaurant ! Totally lost looking for somewhere to eat and we found this wonderful little place. Funky Forest Cafe is the best place I've seen for young kids in the my ten years of coming to the costa del sol. Play equipment, bouncy castle and bunny feeding too. This is a very small and relaxed place to have a great breakfast or lunch whilst the kids play on the bouncy castle of pet the rabbits. Unlike a lot of kids playgrounds, the food here is really good and healthy. We visited Funky Forest Cafe after a friends recommendation. What a lovely way to spend an afternoon! My sister loved playing on the equipment and looking at the rabbits. There was also a bouncy castle which she enjoyed. Meanwhile the adults enjoyed a drink and snacks in the seating area. It is such a safe and friendly environment! We will definitely be returning. My name is Robert and I've headed up Customer Relations for Marbella Family Fun since April 2014. Your feedback concerns me and I would welcome the chance to speak with you directly on your experience as it is the first time I have heard a negative comment regarding Funky Forest Cafe. I will also raise this issue with Funky Forest Cafe directly to understand their side and update this page with any relevant feedback. What I can say is that my own children have been to Funky Forest on multiple occasions and we have always been very satisfied with the experience. You can reach me anytime at: robert@marbellafamilyfun.com or by phone at 671 450 434. I would welcome the chance to hear from you on this matter. Marbella. Family fa fun deletes Legit Reviews? What kind of company and website is this? You let companies write fake reviews about themselves and delete the honest and accurate review of a bad experience to warn other patrons about the rude nature of the man owner and marbella family fun deletes it? Because the Funky Forrest Cafe requests it? wow so all your reviews are fake! And you only accept positive fake reviews written by owners like robin at funky Forrest! This comment has been removed at the request of Funky Forest. If you would like to repost your comment, please enter your email address and name in the requested fields. I never did a coment before about this amazing place, like all the families that enjoying coming to Funky Forest every week to eat their delicious food with the best service while kids are playing. I was today by coincidence with the "anomimus" guy that wrote the coment before, the staff at Funky F are always really sweet and patience with kids & adults. This people were coming for a week using wifi, plugging their pc and not consuming at all, there is no way that a restaurant can provide all those services if the people that goes there don,t eat & drink there, the waiter said in a really polite way and I was there, there are people that don´t understand the obvius things and after try to hurt the place making this kind of coments, so unfair!! Thanks Funky Forest we are really happy to have you !! During our holiday last summer we ended up with 2 family's at Funky Forest Cafe. The kids loved it for various reasons; the garden with rabbits and swings, the food, the staff, the entertainment etc. To see your kids playful and happy is one good thing, the staff did know how to indulge us as well. Nice beer, wine, food and service made us feel at home and made FF our hangout next summer too! Funky Forest is a breath of fresh air on the coast. Healthy food, friendly people, great outdoor covered area which is perfect for when it rains. Great weekly timetable of activities that will meet the requirements of most childrens needs most of which can be attended on a drop in basis. Creative space, healthy tasty food. The whole concept is just what the coast needs. Beautiful Birthday Parties to make your little ones feel special and a great disco for after fantastic for little girls. Great place to go with girlfriends for a coffee, croissant and a chat while your kids entertain themselves. Funky Forest is worth a vist! We wish Laura and Robin good luck with their new venture! I didn´t know there were a place like this one, Illy coffee, great service and food. Try the veggie burger!! Summer camps, rabits in the beautiful garden, a piece of forest next to the main road. They have been open just for a couple of months, have to go and visit...amazing! And free entrance, the only place we've been able to chat while we are enjoying a meal! Enjoyed Funky Forest together with my grandchildren, will come back very soon again!! A really nice place to go to for kids & parents. Wish Robin and Laura a lot of succes with their enterprise in this time of "crisis". They are a very brave and enthusiastic young couple, so good luck guys. Have a question or recommendation about Funky Forest? Enter the Title of your Question or Recommendation about Funky Forest? What other visitors have said about Funky Forest?